Martin Honert’s meticulously rendered sculpture Riesen (2007) is inspired by memories of his childhood. "Childhood is a theme for me because I think it’s important to discover what’s way past but still in the memory as an image." His large-scale human figures manage to capture a vivid immediacy and sense of wonder achieved by recreating the world from a child’s point of view. Instead of looking back from an adult’s nostalgic perspective, the artist bases his works on family photographs and illustrations from schoolbooks, as well as his own childhood drawings, using scale and illusion to "save an image before it dies within me". 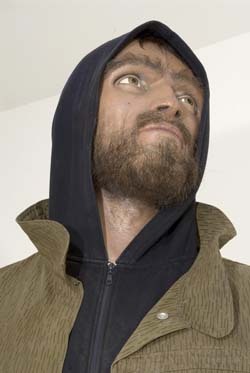 A feeling of being afraid in a huge and empty exhibition space originally inspired Honert to make his oversized figures entitled Riesen (which translates as ‘trek’ or ’journey’). 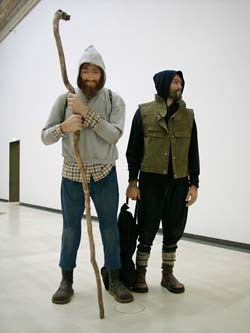 The sculpture is composed of two bearded men, dressed in ordinary, contemporary clothing. 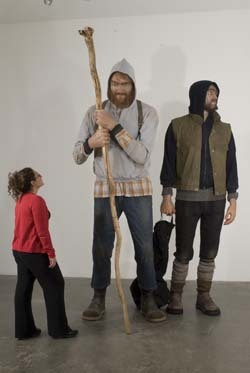 The fact that they are each 2.72 metres high is not entirely fantastical or arbitrary; Honert took this specific measurement from the tallest man of the 20th century, an acromegalic American named Robert Wadlow. The figures wear backpacks, trekking boots and hoodies; their clothes bear marks of wear and dirt, and one of them holds a walking staff. But despite their unremarkable appearance, and their conventional realism, something about their purpose remains unexplained to the viewer. Like Cyclops-sized giants that have strayed into the gallery, they could be updated mythical wandering characters from a fairytale set in the wilderness, or social outsiders, fearsomely fending for their own survival.